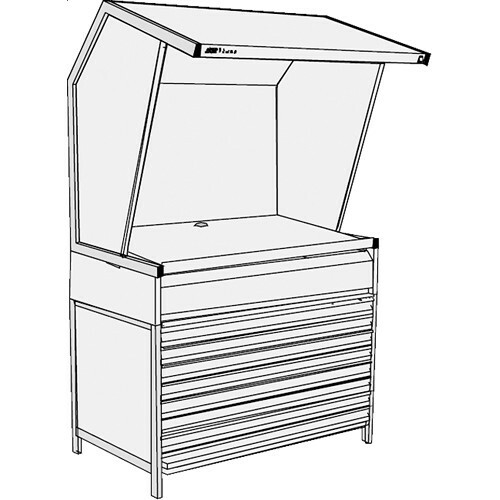 Viewing Area: 29 x 52"
The CVX-3052/FD/1F Color Viewing Station from GTI is a standalone color viewing station with a set of eight flat file drawers and one deep file drawer. It utilizes Graphiclite T8 D50 lamps that feature a 5000K color temperature to ensure that your images will be viewed properly as well as a built-in print bar for attaching prints quickly. The lights shine through a diffusion lens to guarantee even lighting and good illumination. Also, it has a large viewing area of 29 x 52" for large format prints. Physically, the station has a metal table top with removable side walls for more viewing options. Additionally, this unit comes with a LiteGuard II viewing system monitor which will display lamp hours used and lamp hours remaining for your station. Also, it will show lamp warm-up times, out of tolerance information, and where to obtain replacement lamps.